I created this pie specifically for the 2011 National Pie Championships, where Darren McGrady, former Chef to the Royal Family, tasted and commented on the creations inspired by the recent Royal Wedding. Whether it’s that event or GLBT Pride, this is the perfect summer pie. 1. All ingredients should be cold. Combine all the dry ingredients in a large mixing bowl. Add shortening and butter. Using a pastry blender, cut in the shortening and butter until the mixture resembles course meal. 2. Drop by drop, add the cold water. Mix in with fingertips, not hands, as palms will warm the dough. Continue mixing water in until the dough begins to hold together without being sticky, but not crumbly. 3. Lightly spray a deep 9-inch white ceramic pie dish, allowing the excess pastry to hang over the edge. Roll out the dough, and place in a pie plate. Chill in the freezer for 10 minutes. 4. Preheat the oven to 400 degrees Fahrenheit. Line the pastry shell with parchment and baking beans or beads. Bake the shell for 10 minutes. Remove the paper and beans/beads, and return to the oven for 10 more minutes. Spread jam over bottom and sides of warm piecrust. Cool. Makes pastry for 9-inch single-crust pie. Using an electric mixer, beat cream cheese and sugar until light and fluffy. Gently spread cream cheese mixture over jam layer. 1. Mix sugar and cornstarch with water. In a heavy bottom saucepan, cook over medium heat, stirring constantly until the mixture begins to thicken. 2. Reduce heat to low. Fold in blueberries and cook, stirring gently until blueberries are well blended into thickened mixture. Remove from heat, and cool completely. Carefully spoon cooled blueberry mixture over cream cheese layer. Top with Sweetened Whipped Topping. 1. Whisk or beat heavy cream until it begins to thicken. Gradually add confectioner’s sugar and vanilla. Continue beating until stiff peaks form. Pipe decorative peaks in an orderly fashion, topping each peak with a blueberry. 2. Finish wedding pie with decorative ribbon around the outer edge of a ceramic pie dish. Glue inside to pie dish if necessary. 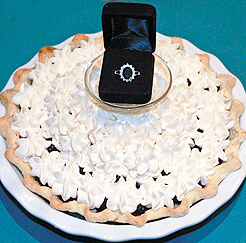 Using center holder, place engagement ring in center of pie, and serve to guests. Serves 8-10 unless cut into smaller servings. This looks incredible, I’m thinking it can be used for anniversaries, Mothers day, Amelia Earhart Day, Chinese New Year, Fat Tuesday Mardi Gras, Victoria Day, Paul Bunyan Day, Bastille Day, International Day of Peace, First Day of Autumn, and Thanksgiving or any Tuesday would work for me.